This beautiful bangle bracelet features indicolite square and bicone crystal beads with silver plated squaredelles made by Swarovski. Combined with silver plated tubes and sterling silver spacers and clasp, all of the elements combine to create a sleek, contemporary look to this piece. 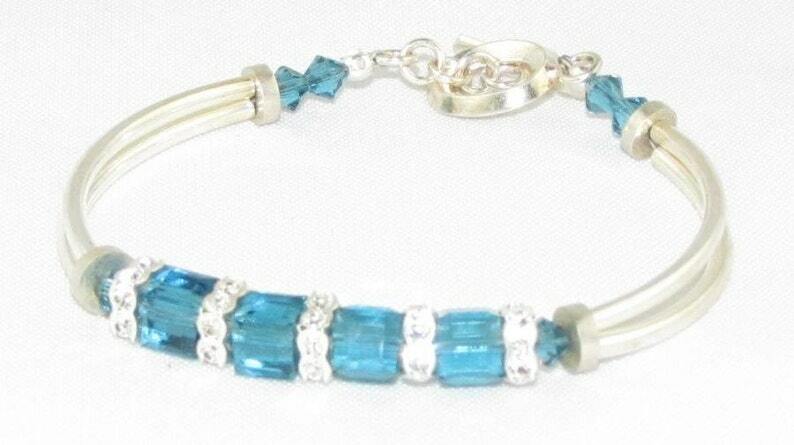 I think this bracelet would be perfect for bridesmaids or prom providing just a little color and bling. This bracelet is 7 inches long, but I can make it with a lobster claw and chain to make it adjustable. Please convo me if you would like additional bracelets for your bridesmaids or a different color. I’m happy to make whatever you want. Don’t miss the matching earrings at http://www.etsy.com/listing/49245595/blue-crystal-earrings. Gorgeous "earthy" necklace...absolutely love it! Also, many thanks for the "bonus" necklace...appreciate it! Both a stellar artist and seller! Kathy wore it yesterday and it looked great. Very well strung together and the order got here jack rabbit quick. I am actually going to talk to the artist about a special. Payment is only by Paypal. If you are not happy with your purchase, notify me within seven days of your receipt of the item. Return shipping is paid by the buyer. After the item is received in the original condition, your Paypal account will be credited. Shipping is by United States mail or UPS one to two business days after payment has cleared. The package will be mailed to your Paypal address. If you prefer another address, notify me before or at the time of your payment.